BIG NEWS! 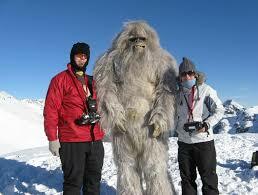 An Oxford professor has solved the 300-year old Yeti mystery. In analyzing two hairs reported to belong to a Yeti, he has concluded that the Yeti’s DNA matches up with that of the jawbone of a Polar Bear who lived 40,000 years ago in Norway. We at Tv’s Weblog caution the Yeti to remain calm. We all have that crazy Aunt who can’t be allowed in public.